Power-Lift Windows. Ford is the only car in its field with push-button control of all four side windows! Fordomatic Drive. It’s the only “automatic” in Ford’s field that combines torque converter smoothness and the “Go” of an automatic intermediate Gear! 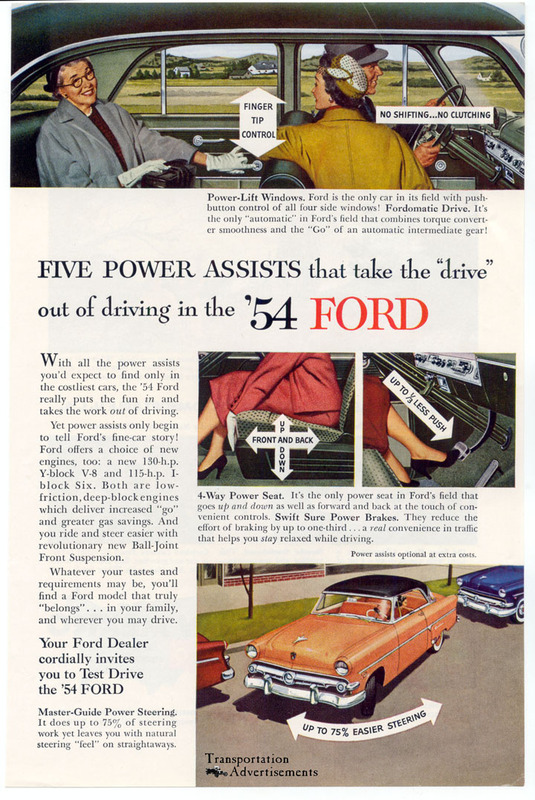 With all the power assists you’d expect to find only in the costliest cars, the ’54 Ford really puts the fin in and takes the work out of driving. Yet power assists only begin to tell Ford’s fine-car story! Ford offers a choice of new engines, too: a new 130-h.p. Y-Block V-8 and 114-h.p. I-block Six. Both are low-friction, deep-block engines which deliver increased “go” and greater gas savings. And you ride and steer easier with revolutionary new Ball-Joint Front Suspension. Whatever your tastes and requirements may be, you’ll find a Ford model that truly “belongs”… in your family, and whatever you may drive. It does up to 75% of steering work yet leaves you with natural steering “feel” on straightways. 4-way Power Seat. It’s the only power sear in Ford’s field that goes up and down as well as forward and back at the touch f convenient controls. Swift Sure Power Brakes. They reduce the effort of braking by up to one-third… a real convenience in traffic that helps you stay relaxed while driving. Power assists optional and extra costs. Transportation Advertisements is powered by	WordPress 5.0.4 and delivered to you in 0.588 seconds using 29 queries.